The Hoftrompeters (court trumpeters and timpanists) were the oldest ensemble at court. The Elector, who held the title Grand Marshall retained the trumpeters and timpanists as an insignia of his rank. The Dresden group consisted of two timpanists and twelve trumpeters who were further subdivided into 'Field' trumpeters and 'Musical' trumpeters. It was the 'Musical' trumpeters who were called upon when required by the Hofkapelle. The Bock is a type of bagpipe which came to be known colloquially in 18th century Germany as the Polnischer Bock. Bock translates directly as ' goat ' and from the accompanying picture we can see that this is also a descriptive name due to the fact that it retained that animal's skin, fur and generally head and legs, either carved in wood or the genuine, shrivelled article. The history of this instrument is difficult to trace however it appears to have originated in the Western Slavonic region. 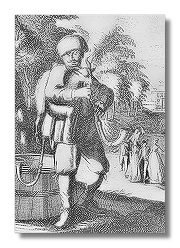 By the early part of the 17th century the ' Polish bagpiper ' had become something of a stereotype in German courtly theatrical representations, frequently featuring alongside performers dressed as Turks, Moors and Spaniards. 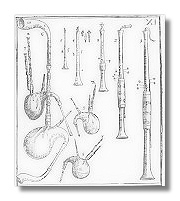 "the Bock has its chanter and bottom C-pipe mounted with large horns. Some are pitched a 4th lower, in GG and so are called great Bocks"
The picture shows a bald stomach of a goat without the lifelike appendages of other illustrations, but does feature the characteristic flared horns attache to the end of the chanter pipe. The Polnischer Bock player found in J.C. Weigel's Musicalisches Theatrum (Nuremburg, c1722), a series of engravings depicting musicians and their instruments has a verse set underneath the picture which begins: "I am a handsome man and can pipe so splendidly on the charming Bock…." and continues with a reference to dancing bears. Time and time again contemporary popular literature alludes to the bagpipe as an instrument predominantly associated with the lower strata of society, played by street musicians and peasants, usually in an outdoor setting. Despite its relatively low status, the bagpipes became highly fashionable in some European circles in the late 17th and early 18th centuries – particularly at the French court where the upper strata of society were increasingly obsessed by all things pastoral. Whilst architecturally the model for Augustus the Strong's Dresden was undoubtedly Italian in matters of taste he was particularly influenced by French style and in common with other German courts of this period he employed a Bock ensemble. The Bock or Hofpfeifer and Jagdpfeifer therefore provided music for Bauernhochzeiten and other court dances, for service in the country, hunting events and appearance in festive processions. The Bockpfeifer normally contained between 12 and 16 musicians while the Jagdpfeifer had a smaller complement of ten. For further details see Sam Owens interesting article entitled "Polnischer Bock music at the Wurtemburg Court c1730"
The Polish or small Chamber Ensemble contained twelve musicians, the most prominent of which were Giovanni Alberto Ristori, Johann Joachim Quantz (who was then an oboist) and Francesco Maria Veracini who served in this ensemble when he first arrived in Dresden. The Polish Kapelle travelled with the King, particularly to Poland and it was only later that Frederich August III maintained a 'truly' Polish Kapelle in Warsaw. The Polish Kapelle members earned between 200 and 240 thalers per year, part of which was towards lodgings in Warsaw. Additionally it should be remembered that chamber musicians were entirely responsible for the creation of their own repertoire. The Protestant court church survived Frederich August II 's conversion to Catholicism purely for the members of the nobility who chose not to convert. This ensemble had no instrumentalists of it's own and consisted of a cantor, vice cantor, organist and six choir boys. Pantaleon Hebenstreit was in charge of this ensemble from 1735 to 1751. The conversion of the former opera theatre to a Catholic court church in 1708 meant that a new repertoire of sacred music corresponding to the elaborate court music of the day was required. This could not be established without the ' importation ' of works by composers outside of court including works by eminent contemporaries Lotti, Fasch, Caldara and Durante as well as stile antico works by composers such as Palestrina. As with the chamber music repertoire the expenses for acquisitions of this kind had to be paid by the Kapellmeister or composer responsible for the performance. The court only covered the cost of copying the parts. The Protestant Heinichen as Kapellmeister was given the primary responsibility for the repertory of the Catholic court church between 1720 and his death in 1729. Heinichen's declining health in his later years did not allow him to carry out these duties singlehandedly and he increasingly came to depend upon the assistance of his colleague Jan Dismas Zelenka. Indeed Zelenka and J.S. Bach were the first composers to hold the position of Kirchen-compositeur (Church composer), a position that did not exist before the accession of Frederich August II. For performances on solemn occasions such as Requiem, Masses and Passion week oratorios the entire Hofkapelle was employed. Interestingly compared to opera performance practise the string sections were reduced by one desk, surely an attempt to allow the solo voices employed to be more dominant. Further discussion of sacred music for the Catholic Church can be found in the Zelenka and Heinichen sections.